Remember in January when I saw the geneticist and I was frustrated with more waiting but hopeful because I was finally getting somewhere? She was going to refer me to a cardiologist specializing in the autonomic nervous system to control my autonomic issues and order the tests she needed before making a decision about an Ehlers-Danlos diagnosis. Frustration aside, I felt like I was finally going to be able to take a break. My case was in her hands now; she was going to take over and things were going to happen! Four weeks later I hadn’t heard anything and my family doctor still didn’t have a report from my genetics appointment. There is a very fine line between being that annoying, bothersome patient, and being the overly-patient patient who in reality is falling through the cracks. I like to stay on the overly patient side of that line because I don’t want to be a bother but I decided to send an email to the genetic counsellor to see if the referrals had at least been made. They hadn’t. The doctor they had in mind had retired and now they didn’t know where to send me. There was a pediatric autonomic specialist, and an adult autonomic specialist out of province, but no one local. I was crushed. Devastated. After years of trying to get someone to recognize that my problems were not all nutrition related I finally felt like I was almost there so when it turned out that after four weeks of patiently waiting I wasn’t any closer to answers, I felt hopeless. I had myself a pity party for the rest of the day. Pity mixed with anger. I put my boxing gloves on and I was ready to pick a fight. Why was it impossible for me to get anywhere? Why was I having to work so hard? I was tired of being in charge and I just wanted someone else to take over. It was a really good pity party. There were party hats and goodie bags, and even pin the tail on the donkey! Of course what I really mean is that there was me lying on the kitchen floor with my giant stuffed moose feeling really sorry for myself while my family cautiously stepped over me. The party did however take a turn for the better when my brother came home and cheered me up by watching Valentine’s Day with me. And of course there was crocheting, because no party is complete without a little crochet. The next day I bounced back. So what if I didn’t want to be in charge anymore? I was in charge. I am in charge. And I mean it’s my body and my health; I guess I should be in charge. I contacted some other local patients with the same illnesses as me and I got the name of a local doctor who could hopefully help. No, it wasn’t an autonomic specialist, but it was a start. And then I gave that name to the geneticist. When a week later I hadn’t heard anything back I made an appointment with my family doctor for March 3. March – new month, new word. In February it became clear to me that I will always be my best advocate. It goes hand in hand with trusting my gut; I know my body best and so I can advocate for myself best. No matter how tired of being in charge I may be, that will always be my responsibility, my job. And right now it’s my most important job. So I went to that appointment on March 3 with my boxing gloves on and my mouth guard in because I was prepared to fight! While I don’t own boxing gloves or a mouth guard, I was ready to fight…I mean advocate. It was now March, after all. I brought trends in vitals, a list of symptoms and the name of the doctor I wanted to see. It turned out that my doctor knows the cardiologist I had heard about, thinks highly of him, and she happily referred me to see him. I was expecting to wait weeks to hear about an appointment date and for that appointment to be scheduled sometime in the summer, maybe even the fall. You can imagine, then, how ecstatic I was when I got a call within a week and an appointment for March 31! I was so excited that I cried. I’m serious, there were tears of joy. March 31! That’s next week! How appropriate that my appointment falls in March when my focus is on being an advocate for myself. And you can bet that I’m prepared to advocate for myself at my appointment next week, too. In fact, I have charts. Yup, I’m that patient. Call me crazy, but knowing what is going on in my body makes me a better patient and allows me to figure out what I need and advocate for it. Plus I’m an over-achieving science geek and I love charts and figures. Okay now what is the point of this very long story? For one, my ‘one word’ for March is advocate…the verb and the noun! My other point is that we can’t expect other people to make things happen for us. Every situation is different of course, and I’m not suggesting we be disrespectful and rude in order to make things happen, but we also owe it to ourselves not to become victims if there is something we can do to change the situation. It’s okay to ask for what we need. We might not get it, but at least we’ll know we tried and there is peace in that knowledge. We are in charge of ourselves, and as frustrating or tiring as that is at times, it’s also empowering. So boxing gloves down and chin up. P.S. 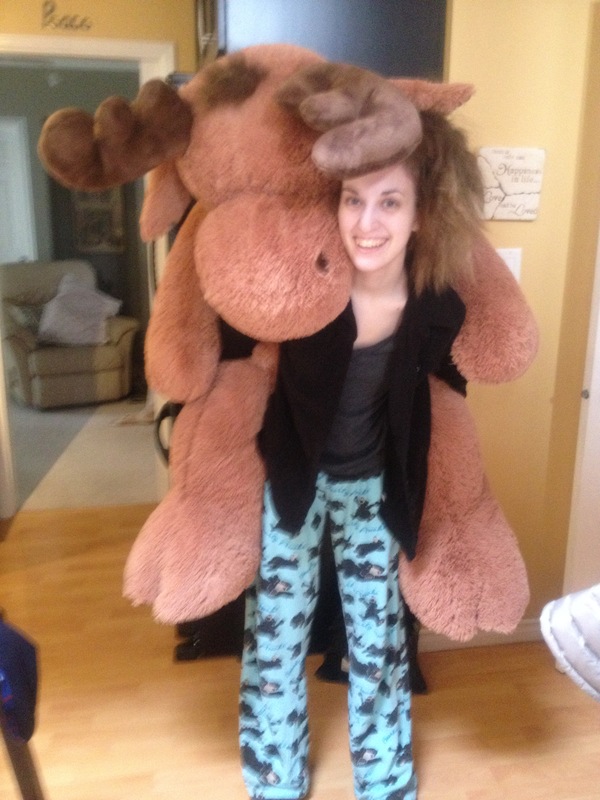 I really do have a giant stuffed moose. See? P.P.S. I also have some crazy hair, I know. You’re very funny and very positive. I’ve been having a pity party and I didn’t realize it. Thanks for the positive perspective. And thank you for the positive feedback! I hope you are able to find some positives to lift your spirits. P.S. You are not the only one to keep charts and stats…how else can one spot a trend coming? It is all part of the detective work. Sometimes I worry that I might be misunderstood as being some hypochondriac when presenting to the hospital but overwhelmingly everyone likes that I keep a journal with all the critical info in it – it makes their life easier because they can easily photocopy the information and I can also refer to it to give accurate information in those moments when I am too foggy to remember what day it is. They all appreciate a patient who is interested in their care and can articulate what they need etc. Good on you for arming yourself with everything you need to stand up for yourself. Once again reading your post has been entertaining, despite the hardships you have had to endure during this entire ordeal. The phrase you wrote that stands out most for me, probably because I can relate to it almost daily is this: “we also owe it to ourselves not to become victims if there is something we can do to change the situation. It’s okay to ask for what we need. We might not get it, but at least we’ll know we tried and there is peace in that knowledge.” For you to realize that, and act on it.. advocating for “you”.. shows that you have the determination of a true fighter… gloves optional! I look forward to your next post! As always, Teri – thank you for taking the time to read and share your thoughts with me. And I’m so glad you can find things that resonate with you. Have a great long weekend!